You can choose from a number of different options when you are interested in boarding your dogs with us. 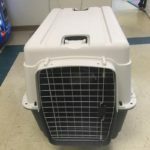 Whether it is your first time boarding your pet or your dog is an experienced stay-cation companion, you still want the best for your pets while you are away. At Dogs By Andy K-9 Services, our facility was specially designed by Master Trainer Andy Hanellin with boarding rooms, separate dog training areas, a puppy play area, and indoor training rooms. This way, your pup gets the most out of his or her stay, whether it’s just for the night or for over the course of a few days. Our facility is safe and secure, with 24-hour video monitoring, fire suppression and a full sprinkler system, as well as a state-of-the-art security system. Our year-round climate controlled buildings ensure your pet stays comfortable at all times. 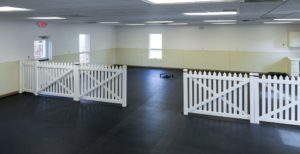 Dogs By Andy Kennel and Training Center in Huntersville, NC was specially designed by Master Trainer Andy Hanellin with boarding rooms, separate dog training areas, a puppy play area, and indoor training rooms. Our facility is safe and secure, with 24-hour video monitoring, fire suppression and a full sprinkler system, as well as a state of the art security system. Our year-round climate controlled buildings ensure your pet stays comfortable at all times. Please call any time during business hours to make a reservation. You may bring your dog in any time the day you are scheduled to Check-In. Dog boarding in the Huntersville area offers a number of benefits for you and your pet while you are away. When you have to leave your dog while you go away on business or vacation. Before you submit your reservation request, please read our Overnight Boarding Policies and Vaccination Requirements. 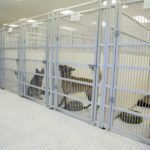 Dogs By Andy Kennels and Training Center meets all USDA requirements for boarding facilities, and one of the ways we do this is by requiring all pets staying with us to have up-to-date vaccination records on file. At Dogs By Andy K-9 Services, we provide dog boarding for residents of Huntersville, Mooresville, Concord, Gastonia, and the Charlotte, North Carolina area, including Myers Park, Weddington, Ballantyne, and SouthPark.